Translations in AxCMS.net are translations made for the localization of both the AxCMS.net itself and the template projects. The default language (used in code) of AxCMS.net is called Ax-Language, it contains both German and English parts. Ax-Language cannot be changed and is translated to the language of choice. 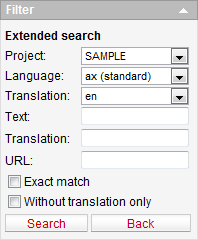 By default, AxCMS.net offers English and German translations for the Ax-Language. 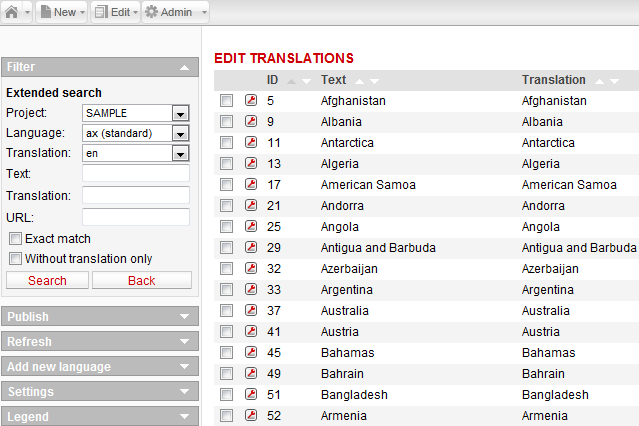 Users are able to make their own translations of any language manually on the LanguageOverview page. To access the LanguageOverview page, go to Edit -> Translations. Extended search tool with numerous filters. You can publish the translation changes for a whole template project. 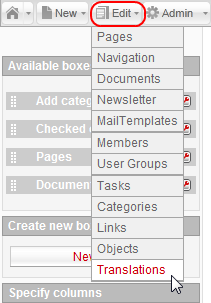 Available projects can be selected from the dropdown. Refresh the translation data on the page. A new language can be added with this function. 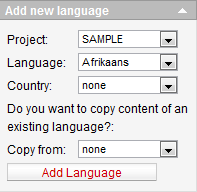 You can select project, language, country or copy content from an existing language. You can choose to edit all languages here. The meaning of the tool icon (Edit) is explained here. The list of available translations.